In the first of an occasional series, [fictional] Belgian fashionista Elleke van Boucheron and I will be offering our insights on a range of pressing [and wholly invented] fashion problems. Real contributions welcome. My partner insists on wearing those orthopaedically approved sandals favoured by Canadians, vegans and the scientific community all summer. He says they are 'comfy'. I say comfort is for wimps and he is embarassing me. What to do? Your partner is clearly a very fashion forward man. 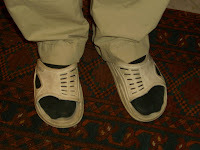 This year's summer footwear should lovingly embrace your foot in holistic foot-shaped comfort. Follow his example! We are loving the soft embrace of fully consenting llama hide, or boiled felt is also nice. Pair with a floaty pair of hemp loon pants in earthy tones, and a dressy vest top, maybe one featuring a nice slogan like 'Nuclear power? Nein danke' and you will be the best dressed couple at the chanting workshop! Your fashion pain is a familiar one to me, but darling, if god had meant us to wear foot shaped shoes, why did he invent Compeed? 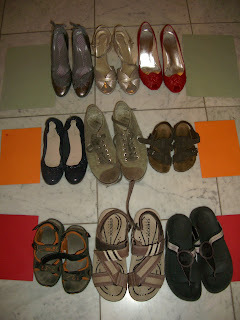 I have come up with an easy 'traffic light' guide to summer footwear, based on a number of specimens found in Casa Jaywalker. Clearly, your beloved is in the red section with his cushioned comfort and toe freedom. I don't like to scare you unnecessarily poppet, but it starts with a sandal, it ends with walking trips to the Lake District and Rohan slacks. You must strike back. Be strategic; perhaps insinuate that his choice of footwear isn't entirely manly? How could he play rough sports, kill wild creatures, or operate heavy machinery in his foot shaped velcro strapped horrors? He couldn't, could he, and perhaps you need a man that can. A man who knows that wild boar don't respect cork soles. .. just cut your losses and get out. Now. Have added you to my roll iheartfashion, not only on strength of your lovely blog but on your excellent choice of reading matter. More big fashiony air kisses to you! ps - I meant on your profile, not reading this nonsense!